The first North Carolina Guo Juan Workshop was a great success, delighting and inspiring the fortunate participants. The event was held on August 25 and 26, in Hillsborough, NC, and this "Southern Part of Heaven" was made even more heavenly with the presence of this great teacher. 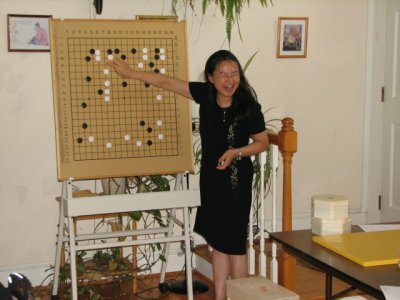 Guo Juan gave valuable lectures, reviewed everyone's games in great detail, and introduced our group to Survivor Go, which was a nice change of pace from the intensity of the rest of the weekend. She shared proven formulas for personal improvement in our game, and suggested practical actions to improve our club and the quality of go in our area and our hemisphere. At weekend's end, each participant felt stronger, more knowledgable and more deeply interested in this wonderful game. 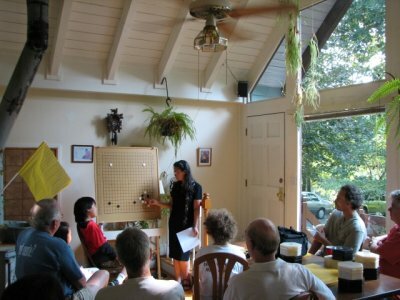 The workshop was held at Bob's house in Hillsborough, North Carolina. Thanks to Dave and Frank for bringing chairs, and Juan for picking up donuts on Sunday. Lunch, drinks and snacks were provided onsite, as were boards, clocks and stones. 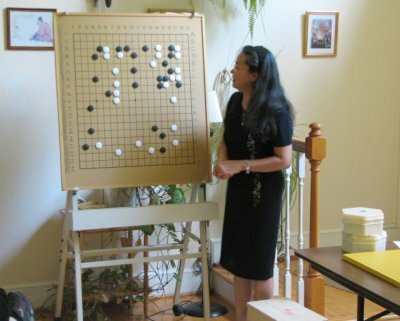 Guo Juan regularly travels to the New York area for two annual workshops, on Columbus Day (early October) and Memorial Day (late May). She also holds workshops in other locations in the US and Europe. For more information, see the Events section at http://www.audiogolessons.com. 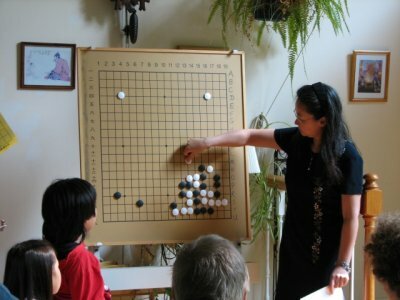 In her workshops, Guo Juan reviews participants' games, and may also review professional games to illustrate principles and share beautiful moves. Her style is relaxed and engaging, with generous infusions of humor. 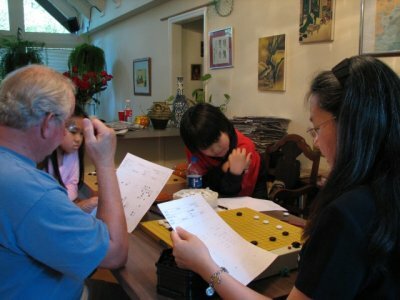 In the Fall of 2007, Guo Juan created a new format for accelerated online training. Click here to visit Guo Juan's Intensive Online Training website.